Locally owned restaurants are the backbone of our business districts and our city’s fabric. They are often the path of least resistance for our returning citizens, immigrants, and others who face barriers to employment. They are proven pathways to small business ownership, wealth- building, and job creation, which is critical to closing our growing income and wealth inequality. Restaurants make our neighborhoods safer because of the foot traffic they attract. They invite vitality and foster vibrancy, and they enrich quality of life by creating spaces for celebrating, socializing, and building community. Unfortunately, these opportunities are not equitably distributed throughout Boston. Admittedly, reforming a 100-year-old law is not usually an attractive or flashy prospect. It can be hard to figure out and unpack the myriad changes from decade to decade in Section 12 of Chapter 138 of the Massachusetts General Laws with regard to Liquor Licenses. But the deep dive and overhaul are worth it to realize healthier, livelier neighborhoods for everyone. In 2014, in partnership with Mayor Walsh, my Council colleagues and the Legislature, we returned the Boston Licensing Board to the city of Boston and created 75 new liquor licenses. It was a game changer for our city. Since then, dozens of new restaurants, and hundreds of new jobs have been created. Existing restaurants could finally complement their burgers and fries with a beer, or offer a well-mixed Moscow mule to keep the conversation going after dinner. In Dorchester alone, we saw the emergence of 17 new restaurants, including Landmark Public House in Adams Village, Dorset Hall in Neponset, Homestead Cafe in Fields Corner and an improved bottom line for existing restaurants like El Barrio in Ashmont and BRED in Lower Mills. This is the tangible impact of liquor license reform, and it also means we are closer to realizing an equity in opportunity for aspiring entrepreneurs. While Boston continues to be in the news as the potential future home of the next corporation looking for new headquarters, I know that the real work of reducing income inequality happens in our neighborhoods, and that is the power of opening the doors to new participants in an industry that can never be outsourced or move online – dining. So in partnership with the Walsh administration, my colleagues on the Council (with some new faces) and the Legislature, I am taking the next step to create an ecosystem that supports our neighborhood sit-down restaurants. And we are being even more intentional with this round of licenses by tying each one to a specific neighborhood, because we know our neighborhoods grow at different paces. Restaurateurs have put their hopes and their dreams into their businesses, and I know some are uneasy about this home rule. We were told that our first round of legislation would devalue existing licenses, but our neighborhoods demand even more walkable, sit-down amenities, and licenses are currently selling for the same price as in 2013. I will always bet on our neighborhoods; the demand continues to grow, and the disparities are still stark. This legislation will go a long way in creating the culinary clusters to support all of our restaurants. In every other city and town in our Commonwealth, licenses are tied to and commensurate with population growth. It is time for Boston to unlock our culinary potential. It’s a time that is long overdue, but we are finally on our way. I don’t know about you, but I’ll drink (in moderation) to that. See you at Tavolo. Cheers! 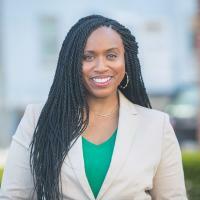 Ayanna Pressley is a Boston City Councillor-at large.